CSSCop helps you write better and more browser compatible stylesheets. It uses the CSS Lint (csslint.net) rules engine and is completely customizable. New!! See a video demoing how the features of CssCop and Web Essentials are ported to Visual Studio 11. CSSCop makes it easy to adhere to best practices for writing stylesheets. It catches common errors that affect browser compatibility and much more. You can think of it as FxCop for stylesheets.Follow me on Twitter for the latest news about CSSCop. It uses the widely used CSS Lint tool behind the scenes. CSS Lint is THE best CSS linting tool on the market and CSSCop brings it directly into Visual Studio in an easy and convinient way. To run CSSCop, simply right-click any CSS file, folder or project in Solution Explorer. That kicks of the rules engine and a list of warnings is added to the Error List. The first time CSSCop is running, it will create a settings file (csslint.xml) in the root of your website. You can modify this file to turn rules on and off as you see fit. 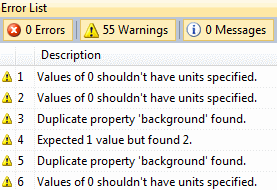 You can also specify whether or not the warnings should be treated as errors and be shown as such in the Error List.